One of the areas of the Windows operating system that Microsoft has not improved a lot ever since the first release of Windows 95 is the context menu. It is unbelievably complicated to remove or add context menu items in the operating system. The problem is amplified by the fact that programs sometimes add items to the context menu, but do not remove them again when they are uninstalled from the computer system. This leaves orphan entries in the context menu that add clutter but no functionality. Windows keeps track of multiple context menus that depend on the file type or location of the right-click. The core locations are computer, desktop, drives, files and folders. Files are special, as it is often the case that file extensions have their own context menu items set. Music players for instance like to add entries to music files. 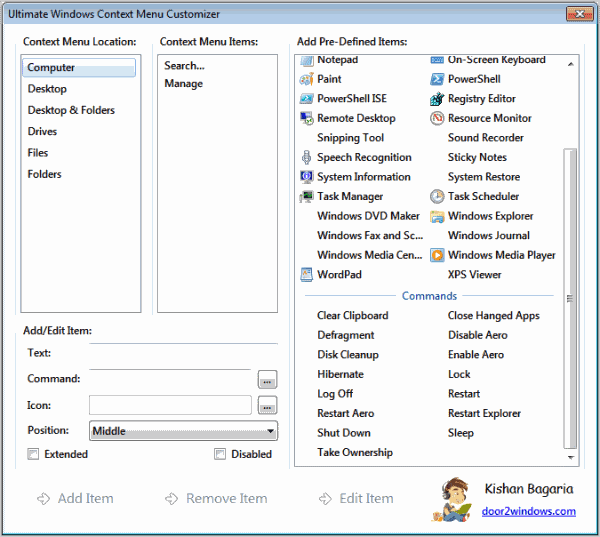 Ultimate Windows Context Menu Customizer is a software for Windows to manage context menu items. The program can be used to add, remove and edit items in the Windows context menu. One would expect that the "ultimate" program would support all context menus, but that is unfortunately not the case. It is only possible to add, edit or remove general items, and not file extension specific items. You have the context menu locations and their items on the left. Just select one of the locations with the mouse to see all global context menu items directly on the right. Selected items are displayed at the bottom under Add/Edit Item. Here you see the text, command, icon and position. Existing items can be edited or removed with a click on the button in the footer bar of the application. New items are added with a click on Add Item. The right side of the program window lists pre-defined items that can be added to the context menus. The list is divided into applications at the top and commands below the application list. Applications include the Windows Task Manager, calculator, Internet Explorer, Windows Media Player or the snipping tool. Commands can be used to enable or disable Windows Aero, clear the clipboard, defragment the PC or closed hanged applications. The context menu manager us a handy program for Windows users who would like to modify their operating system's global context menu items. Only the missing options to edit or remove file type specific context menu items reduces the program's reach. 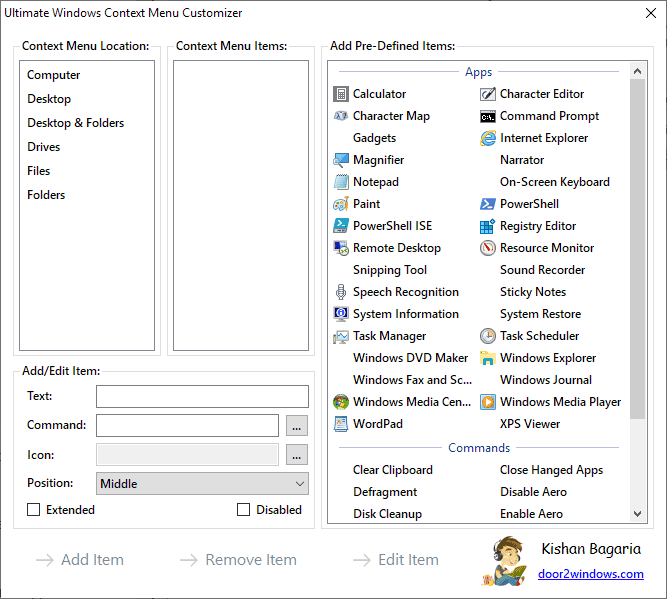 Interested users can download the Ultimate Windows Context Menu Customizer from the developer website. The program is compatible with Windows XP, Vista and Windows 7. A viable alternative is the Windows Context Menu Manager which can modify items based on file extensions. Nifty little tool it seems. If you like an easy to use tool and do not need to edit file extension context menus, then you may be better of with this one. The other tool may be more appropriate otherwise. I cannot download your Ultimate Windows Context Menu Customizer for XP. Is it still available or can you recommend a similar program. These might just be false positives, but I’d like to know for sure before trying it out on my computer. Are you still using the program? Any trouble? I’m not using the program anymore but from a look at the Virustotal page it appears that it is flagged for including pup offers in the installer.